the social media space is constantly changing, but our monthly updates are here every month to keep you in-the-know! As you may have heard, this icon takes you to Insta's newest feature: IGTV. Also available as a standalone app, IGTV is "a new app for watching long-form, vertical video from your favorite Instagram creators." The Washington Post was quick to point out that this definitely feels like a direct threat to YouTube—at a time when many marketers are "growing increasingly weary of brand reputation across the [YouTube] platform" according to Todd Krizelman of MediaRadar. This could also prove key to Insta's continued success with television viewership declining and video continuing to grow in popularity across social. No ads (yet) - There are currently no ads on IGTV, but (obviously) that's going to play a part before long. Users can swipe between multiple areas: including “For You,” “Following,” “Popular” and “Continue Watching"
Commenting - There are opportunities to join existing IGTV conversations by commenting on popular videos. AdWeek has a walkthrough (but there's a subscriber paywall). @Mention sharing: When someone tags you in their Story with an @mention, you can now share the content to your own story. 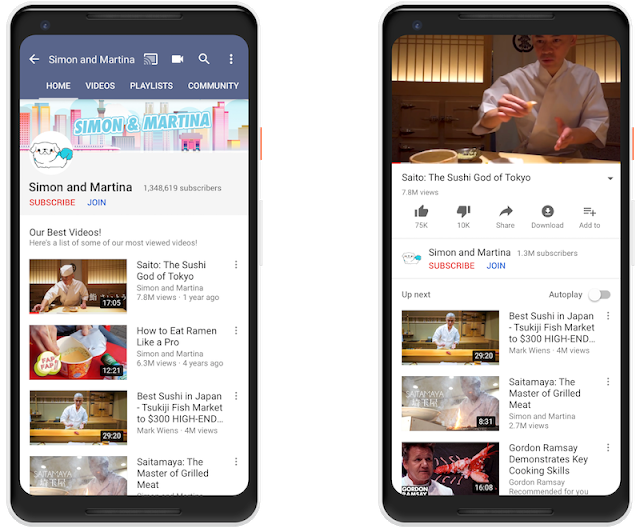 YouTube users can now subscribe to their favorite channels to get exclusive content. This is part of a push from Google-owned YouTube to create more ways for the most successful YouTubers to "earn more money and build stronger communities." The fixed $4.99 "Channel Membership" fee includes 30% that goes to YouTube. The feature is only available to channels with over 100,000 subscribers. Click "Join" to become a channel member. That's not all. Merchandise can also now be sold right from your channel and videos via a new integration with TeeSpring (only available to channels with over 10k subscribers). YouTube Premieres was also announced. Described by Wired as "YouTube's take on a traditional television premiere," it also includes Super Chat, a feature that allows fans to pay to send prioritized messages to creators (this was previously only available in livestreams). In order to add more transparency to business and advertising practices on Facebook, they've created a space called "Active Ads" where anyone can see the ads you're running. There's also a Page Info section that will include things like recent name changes. These sections are visible on mobile via a new prominent button on the page, as well as on the page's sidebar on a desktop web browser. "Trending" was removed: The much maligned trending news section of the Facebook feed was removed suddenly in June. The announcement said FB would be focusing on related features, including "Today In," the "Breaking News" label, and "New Videos in Watch." Facebook Memories: FB announced this new private section of profiles as “a single place on Facebook to reflect on the moments you’ve shared with family and friends, including posts and photos, friends you’ve made, and major life events.” It includes existing features such as "On this Day." Subscriptions for Group Admins: This built-in feature will allow admins of popular Groups to monetize a subscription to exclusive content directly from Facebook (rather than by using third party apps). Subscription Group members can also manage their subscription directly in the iOS and Android Facebook apps. 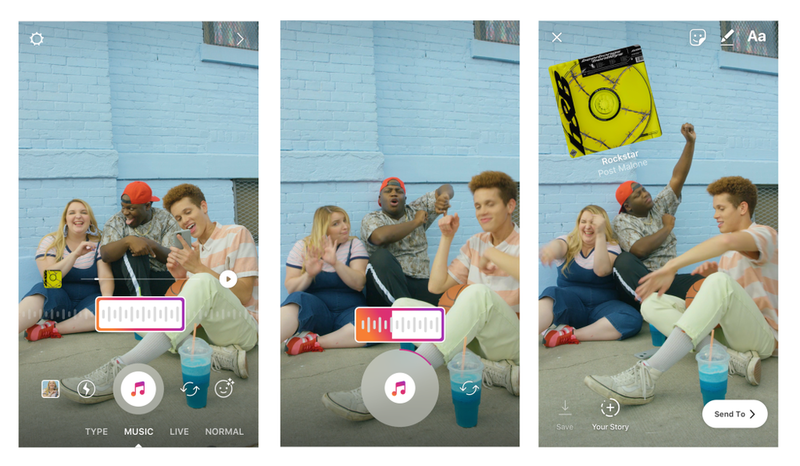 Both Facebook and Instagram rolled out updates recently that let users add music to their original content. "When you open the camera, swipe to the new “Music” option under the record button. Search for a song, select the exact part you want, and record a video as the song plays in the background." Facebook is also rolling out features that let users add music to their Video posts more easily: "we are working to enable people around the world to include music in their videos on Facebook, opening up more options for creativity and sharing memories with friends and family." "To try it out, choose the Lip Sync Live option when starting your Live video. After selecting a song from the song list, you can also add a description and customize your video with masks or a background. When broadcasting with Lip Sync Live, friends will see the artist and song highlighted on the video and can tap to follow the artist on Facebook." TBD if it catches on or not! Snap Kit is a new effort by Snapchat to help app developers "build products powered by some of the best parts of Snapchat." Check out kit.snapchat.com to learn more or sign up. There's also a list of all the current integrations available on the News section of the Snap Kit site where you can see how apps like Postmates, Tinder and more have already gotten on board. Twitter's campaign against bots and trolls continues! According to the Washington Post, "Twitter suspended more than 70 million accounts in May and June, and the pace has continued in July." That includes suspending over 1 million accounts in a single day in some instances. The rate of suspensions has more than doubled since October, when Twitter admitted to Congress that Russia utilized fake Twitter accounts an attempts to influence the US election. Here's another small but meaningful UI change in the Pinterest universe: You can now save a Pin in your desktop feed with fewer clicks! A drop-down menu of your boards will now appear on any Pin you hover over. In order to make organizing as quick as possible, Pinterest will predict which board you want. This has been a Facebook Ads feature for quite a while, but LinkedIn is now jumping on the Carousel Ads train. Learn how to use LinkedIn carousel ads on the LinkedIn Business site. New Updates to Snapchat's Ads Manager – Including a “Snap Pixel” and other measurement improvements. Commute Time for LinkedIn Jobs – LinkedIn now shows users how far a potential job is from home. Creative Spotlight: Absolut – Pinterest likes to highlight what brands are doing well on its platform. This is a nice case study with a fun animation!